Let's look at three mechanisms for tracking us. You can test these yourself with me as I explain them. First is the IP address. If a website, or advertisement within the website, sends you information, then it must have your IP address. The IP address essentially identifies you to your home or office. It won't know which computer within the home, but it will have the ISP assigned IP address. Go ahead and click here: https://whoer.net/. You'll find the IP address your ISP gives you, which seldom changes, plus your zip code, Internet company, city, and much more about you and your computer. You can even pull up a map of your location. Be sure and check the extended version from the tab and even run the interactive detection tests. There is no way to avoid this unless you use a VPN. I've written about VPNs before, most recently here. Of course, your VPN has all this information. Fingerprinting can be done in addition to IP address recording. Fingerprinting collects lots of information about your computer like, how big is your screen, what fonts are installed, what time zone and language you use, and much more. Most of these are needed to properly present the web page to you. You can test your browser for vulnerability to tracking here. When done, click the fingerprinting link. You'll see how many things they can use to define a unique fingerprint for your computer. If they can link that to your Facebook or Google account, they can combine it with your address, name and phone number. Third party tracking is when advertising companies put little trackers on your computer and send you ads and watch your activity. They report back to the advertising company to combine this information with everything else they have on you from all the other sites you visit. In addition to the EFF test above, you can also test your vulnerability to third party trackers at Steve Gibson's site here. Here's how it works. When you send a request for a page to a website, it will return the basic content of that page. Like this. Once the basic page is in your computer, the browser scans through it and requests more stuff. It may request pictures from the original site, like these diagrams which come from my site to fill out this page. But, it can also request advertisements from many different advertising agencies or pictures or videos from YouTube or other sites. When they send requests to places that you never went to they may return trackers, advertisements and other things you might not want. These are third parties. 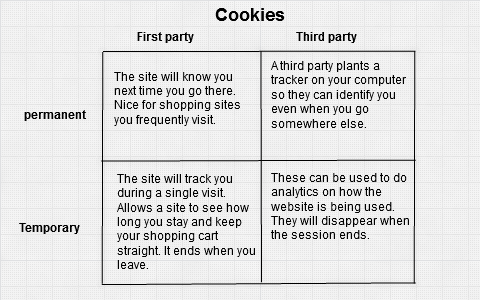 They are not the website you actually visited, but they can still place cookies on your computer. Often these advertising databases get infected and even legitimate sites may then end up giving you a virus. Cookies can be divided into 4 types. First party and third party (you are the second party), and session and permanent (or long term). set third-party cookies to Never. Some browsers offer a special mode for more secure browsing. Chrome calls it the incognito mode. Cliqz calls it the Forget mode. Firefox calls it a Private Window. Only Cliqz is being honest with us. All this mode does on any of these browsers is forget the browsing history on our own computer. 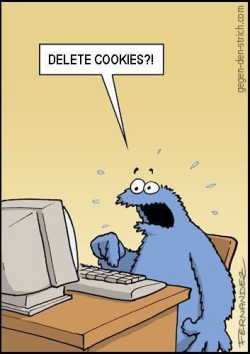 The websites that track us are not affected, however permanent cookies do get deleted.